What is an “army ant”? An army ant is an ant species in which the workers search for food in groups (classically that food is live animal prey, but some army ants effectively take vegetable matter by this means, too). The idea sounds simple but even some experts are confused about what it means to forage in groups, so let me go into the technical details of how the phrase has been used. Indeed, the term "army ant" brings to mind a concentrated (and often huge) mass of predatory ants on a hunt together, and it was in fact used specifically to denote such “mass foraging” species until Edward O. Wilson showed (in a 1958 article in Evolution) these species also tend to be nomadic, that is, change their nest locations frequently (and sometimes regularly). Since then, other authors have pointed out even more traits that also tend to be associated with ants traditionally called “army ants,” notably, the queens are wingless and physogastric (bloated with eggs); food and brood are carried slung under the worker's body; "nests" are produced by workers linking their bodies together, in some cases yielding an exposed mass of resting ants called a bivouac; and the societies reproduce by fission—a young queen starts a new colony assisted by part her mother’s worker population rather than on her own. Varied combinations of these traits have been treated as a “syndrome.” While this army ant syndrome can be a valuable idea, when it comes to the usage of the term "army ant" each additional trait should be regarded as a proprium (a term philosophers employ to describe a nonessential property common to examples of a thing, but which is nonetheless not defining or essential). This is so for three reasons: 1) there are examples of undoubted army ants that show these traits at best weakly (some Doryline army ants can stay at one nest site for months if not years and so appear to be no less sedentary as many other ants; for example, undisturbed colonies of the Asian Dorylus laevigatus stay in one place almost indefinitely); 2) none of these traits are unique to army ants (for an example, see the image below); and 3) the one characteristic that is unambiguously unique to army ants was clear even to early biologists: masses of foraging ants stream along over long distances, with food being found and collected every step of their advance. For this reason it’s my hope that future researchers will focus more on army ant style raids, as far as I’m concerned the pinnacle of foraging behavior in the animal kingdom. I also hope my arguments put forth in the book Adventures Among Ants lead the experts to return to defining "army ant" based on the one trait that is truly diagnostic for them: mass foraging. This revision would disengage the term army ant from the equally useful idea of an “army ant syndrome.” The ants showing that syndrome include nomadic ants that employ long-distant recruitment by scouts to capture prey, among them species that lack mass foraging such as Leptanilla, Onychomyrmex, Pachycondyla analis, and certain Leptogenys. One author who’s made a clear statement of this critical distinction is Sean Brady. Does mass foraging necessarily involve capturing live prey? No. 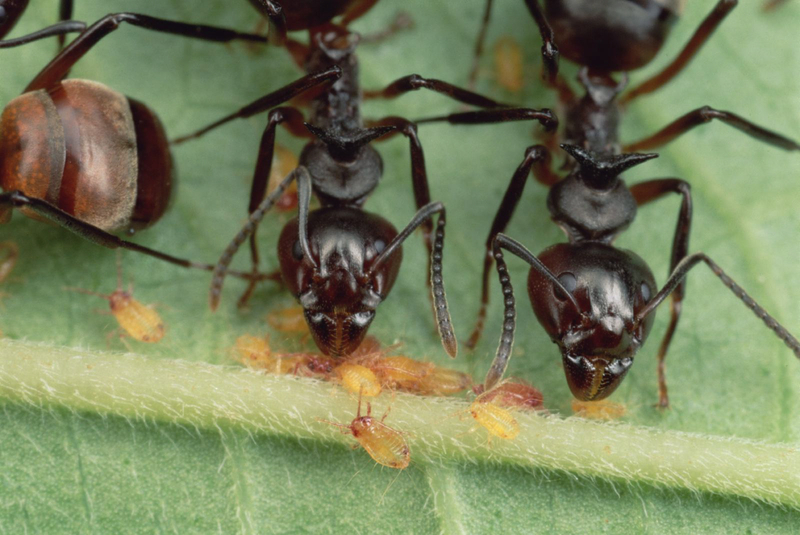 Certain army ants find and eat some vegetable matter during raids, and marauder ants consume as much vegetation as animal flesh. It is entirely conceivable, though perhaps unlikely, that a completely vegetarian species could employ this hunting strategy, for example to drive off competitors. Does mass foraging necessarily involve a large mass of ants? No. Though we expect this strategy to have the most benefits when the number of participants is large, and certainly species with the largest swarms get most of the attention, the raids of some ants can be in the hundreds. I can even imagine two workers hunting as a team. As long as they stick together and one isn't simply leading (recruiting) the other to a food item, the pair would be "mass" foraging. Could any ant species forage both in groups and solitarily? While such a mixed strategy is imaginable, no actual examples are known to date; the marauder ants forage entirely in raids (mass foraging), as do driver ants and the other "true" army ants discovered to date. Definitions of a few terms. Army ant. Formally, the term army ant should be applied solely to ants in the subfamily Dorylinae, all of which mass forage and most (but not all) of which show the army ant syndrome. However, the phrase is widely applied to any kind of ant that mass forage. Group foraging. See mass foraging. Group predation. I follow what I interpret to be the usage of most researchers, and use the term to describe any situation where multiple individuals work jointly to forage, harvest, or retrieve a live prey item. This term comes up most often for prey that is difficult to catch because of its large size or vigorous defenses. Group transport. Carrying of a food item by multiple individuals. Harvesting describes all the steps that ensue outside the nest after a successful bout of foraging—that is, after food is found. These include such behavior as recruitment of assistance to the food, killing prey, dissecting food into pieces, and transporting those pieces to the nest (whether by single individuals or by group transport). Mass foraging. Multiple individuals search for food together (whether they harvest or retrieve the food together after they find it isn’t relevant: see "group predation"). 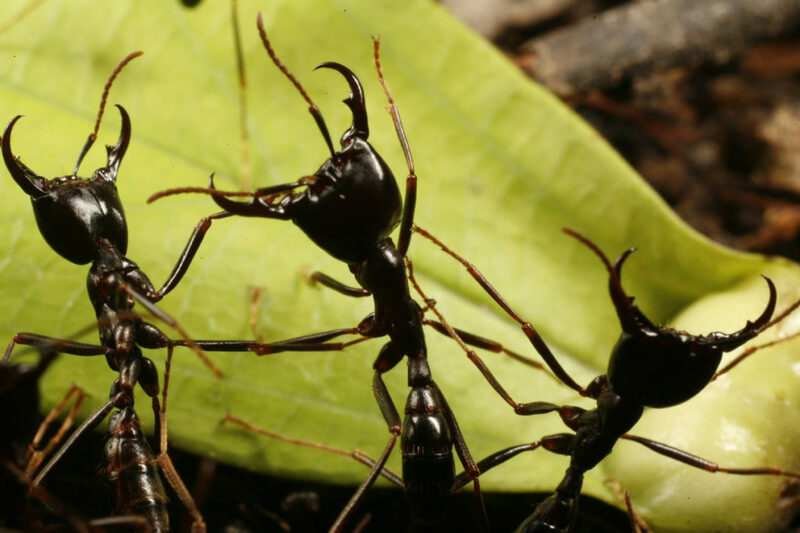 In army and marauder ants, there is a continuous stream of participating workers rather than a specific set of individuals. This is why I prefer the term "mass foraging" over the more widespread but misleading phrase "group foraging." Mass recruitment. The harvesting of food in which a scout recruits a stream of individuals to the site where she found the food. Scout. An ant that forages on her own but recruits assistance when she finds food she cannot handle on her own. Solitary foraging. Single individuals depart (for example, from the nest or from a trail such as a trunk trail) to search for food alone. 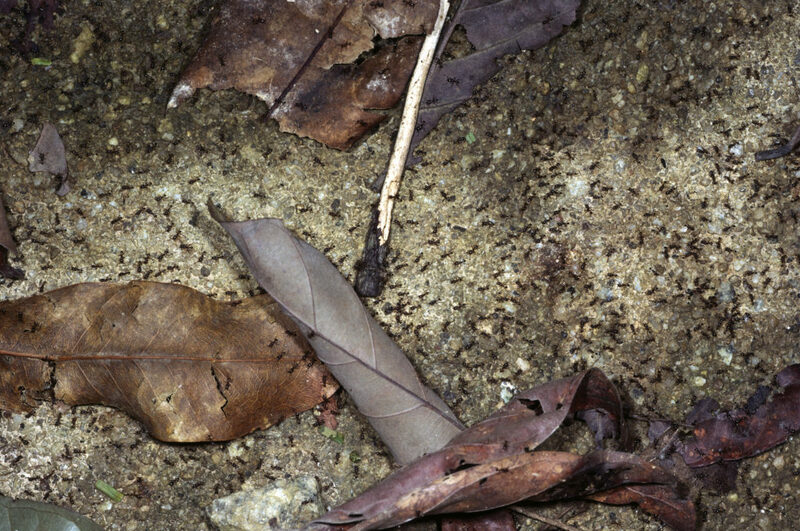 Image above: Malaysia’s herdsmen ant shows characteristics of the "army ant syndrome" (it is nomadic, with physogastric queens and exposed, bivouac nests) and yet is a mealybug-tending species that forages solitarily. © 2019 Mark W. Moffett. All Rights Reserved.